Experience Hillel's impact on the Jewish leaders of tomorrow! Can you come to Taste of Hillel: A Year in the Life? Absolutely, I will be attending A Taste of Hillel on March 24, 2019! Click HERE to make a donation to Vanderbilt Hillel in lieu of coming. Purchase your tickets for A Taste of Hillel on March 24, 2019! $40 per ticket is tax deductible. We can't wait to see you at Taste of Hillel! 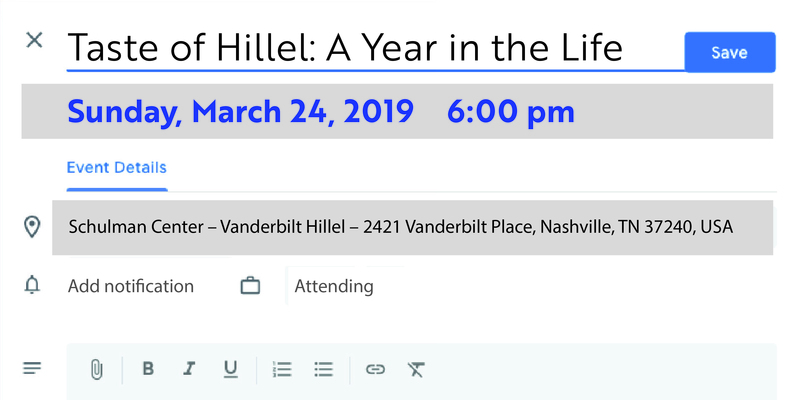 Contact Hillel for questions or more information at 615-322-8376.